For a two year period in the 1920s, from the beginning of 1924 to the end of January 1926, the Soviet Union made use of Postage Due stamps. The first stamps issued were overprints on Kerensky Chainbreakers and were used only in Moscow and Leningrad post offices; the second issue consisted of the 100r Arms and Industry handstamped DOPLATA - this was effectively a local issue available only in Moscow and only from August 1924 up to the end of April 1925; finally, specially designed stamps were issued in 1925 but were quickly withdrawn at the end of January 1926, though they continued to be used (without overprint) as ordinary postage stamps. These stamps are all more common mint than used and on cover they are scarce. Some organisations in Moscow and Leningrad at this period (and maybe elsewhere) were telling people that if they could not afford the price of a postage stamp, they could send their letters unstamped and the receivers would pick up the Postage Due. The covers we do have are often addressed to such organisations (for example, journals). 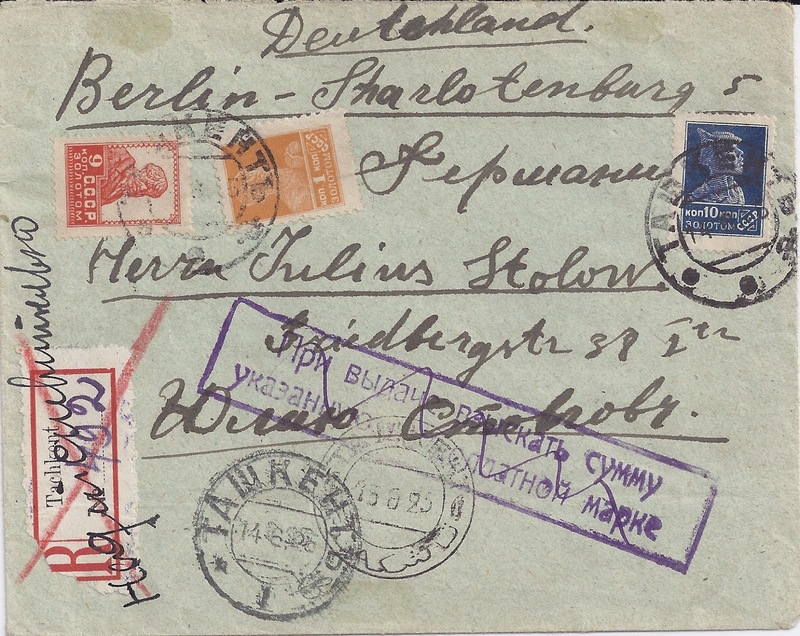 This is a philatelic cover addressed from Tashkent to the German stamp dealer Julius Stolow. It has 20 kopecks in regular stamps on the front and 36 kopecks in Postage Dues on the back, including the Moscow "Doplata" stamp (used outside its period of Moscow validity). These Postage Dues were applied and cancelled at the same time as the regular adhesives - the cancels front and back are the same, dated 14 6 25. It is a complete confection, done by favour, with a violet cachet thrown in and so on. It's no more than a curiosity. And it didn't even pick up a Berlin receiver. This item started out in a small town in the Kharkiv region 30 10 24 where it was noted at the time of posting (using the same ink pad) that 14 kopecks Postage Due should be collected on arrival in Moscow. Arriving in Moscow on 1 November 1924 it picked up a receiver cancel on top of which a 12 Kopeck Kerensky overprinted stamp was applied and then a pair of 1 kopeck DOPLATA stamps (on Pelure paper) with what look like 5th Exsp. cancels. It needs closer examination, but I think it's genuine. It's just a very disappointing fragment, even if it is rare. 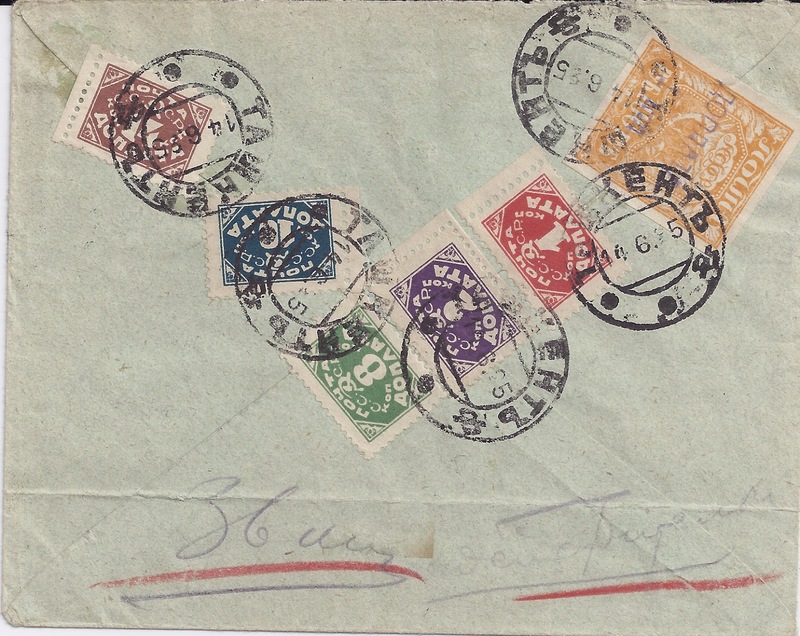 This cover was sent from Ekaterinburg on 22 8 24, addressed to a Moscow journal. In Ekaterinburg, it picked up a cachet indicating that 12 kopecks Postage Due should be collected on arrival. 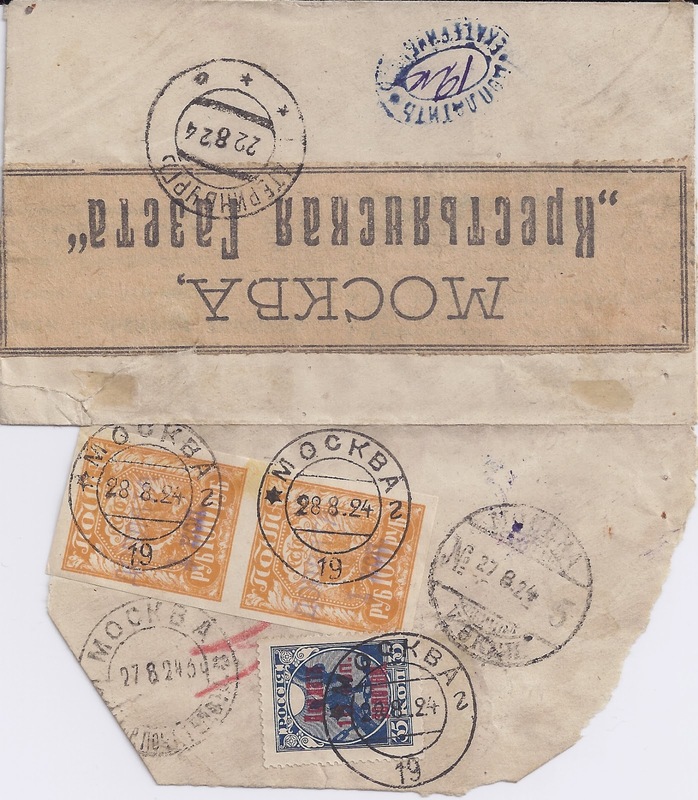 On the back are two Moscow arrival marks dated 27 8 24 after which a 10 Kop Kerensky and a pair of 1 kop DOPLATA stamps was added and neatly cancelled MOSKVA 28 8 24 using a canceller of the 19th Office. The problem is this: in the whole collection of over 60 covers and cards, this Moscow 19 cancel is by far the cleanest, crispest cancel to be found. There is no other Moscow cancel which comes near it for its First Day of use appearance. True, it's a metal canceller (there are indentations) but it obliges me to believe that not only have I got a rare cover in front of me but one which has been cancelled on the first day of use of the Moscow 19 canceller. I think it probable that the Postage Due stamps were applied in Moscow by a post office official - look how the stamps overlap in the same way as they do on the previous cover. But I think the post office official forgot (or did not feel it necessary)to cancel the stamps. So the cancelling had to be done later - by a forger. I can't prove that. What I would need to prove it (or to be shown that I am mistaken) is other examples of this Moscow 19 canceller - and I haven't got any. Readers? Click on the Images to enlarge them and make your own judgements.